Attractive presentation makes a garnish tray more appealing. Caterers and restaurant staff learn techniques for creating balanced, colorful and appetizing buffet arrangements. A garnish tray offers visually appealing and tasty finger foods. Adding sandwiches to a garnish tray provides guests with more choices and a more filling food option. Garnishes that complement sandwiches -- such as a variety of olives, peppers and pickles -- add color and texture to the tray. Arranging a bed of greens offers a festive and inviting cold tray presentation for any kind of event, from a casual party to a wedding. 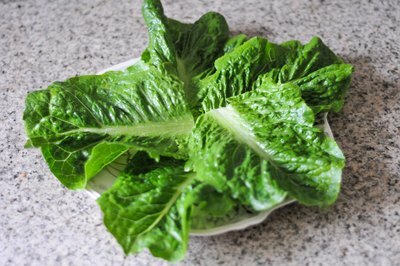 Spread leaf lettuce or kale on a tray. Decorate the tray edges with the top, curly part of the leaves. The base of the leaves point toward the center of the tray. This creates a decorative bed for the sandwiches and garnishes. 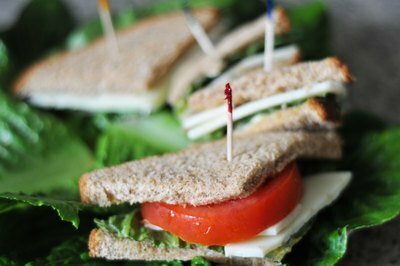 Spear the center of each sandwich with a long toothpick if the sandwiches are layered, such as club sandwiches or slices of submarine sandwiches. The pick keeps the sandwich together on on the tray and makes them neater for guests to select, so the sandwich won't fall apart when someone picks it up. Small finger-food sandwiches may not require a pick. Arrange the garnishes between the groups of sandwiches. For example, arrange rows of pickle spears, olives, radishes and parsley between the types of sandwiches, radiating out from the center of the tray like the spokes of a wheel. Other options include arranging finger food sandwiches in a spiral, or setting up the sandwiches in rows on the tray, with a row of garnishes between each row of sandwiches. Handle food picks carefully to avoid poking yourself. Keep food picks out of reach of children. 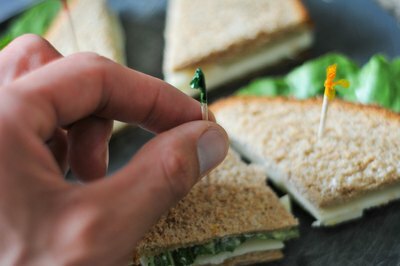 Remove food picks before giving sandwiches to children or impaired adults. Refrigerate sandwiches for as long as possible. If there will be a time lag between making and serving the sandwiches, cover each tray with wax paper or cling wrap to prevent the sandwiches from drying out. Attention to sanitary conditions are important to reduce the risk of food borne illness. Don't leave food out for longer than two hours.